terrible joke. Terrible. Recipe number two from the triumphant return of the gorgeous C. Though somewhat selfishly made (C is somewhat of a.....regretful non meat eater.) I'm fairly sure Lor over at Italian foodies has cooked this one up before me. Or maybe it was Bibliocook. Still. Who am I to look gift content in the mouth. 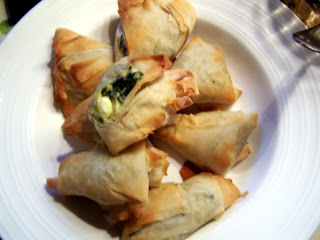 Greek/Cypriot filo parcels, again from Falling Cloudberries. Delectable things when served hot (though they don't reheat fantastically - good taste, but the texture goes....). Blanch in salted water, drain, cool and squeeze the spinach. Get out all that liquid. Squeeze it like you're beating the youngest Brady bunch kid. Chop it as finely as you can. Mix it with the feta, eggs, nutmeg and the parmesan. Season wih black pepper. Preheat your oven to 180C. Lay out a sheet of filo (keeping the other sheets under a mildly moist cloth - the pastry takes 1 hour 15 minutes to defrost), and brush it with the butter. Lay a second sheet on top of it. Cut the sheets into strips, using a particularly sharp knife - it's incredibly delicate pastry along the width of the pastry. The width of the strips is up to you - we went with 1.5 inch strips. Kiros suggests 10cm. Put a dollop of the mix in the bottom right hand corner, and to make the triangular parcels, first fold the pastry. Take the bottom right hand corner and fold it over itself, so it makes a triangle shape. You should be able to continue this all the way up the strip, overlapping 3 or 4 times. Make sure to seal all sides. Brush them with butter on both sides. Chuck the happy little blighters into an oven tray. Cook for about 15 mins, or until golden brown. Serve immediately. I cross contaminated my batch with a little lemon juice, Did them the world of good - the merest hint of acidity serving to really highlight the nutmeg, and bring out the salt and milkiness of the cheese. Apparently, Fallon and Byrne do an (uncharacteristically) cheap feta, sold loose in their deli. Tastes good too, if the reports are accurate. Spiffing. Onward ho. Variations include adding parsley, dill, cottage cheese, onion, spring onion (nice idea that one), lemon juice, using olive oil, and not butter, and, commonly, cooking it as a filo pastry pie. Youtube it for some great Greek grandmothers getting their pastry on. Posted by Abulafia at 8:28 p.m. Still. Here's to resolutions, eh? 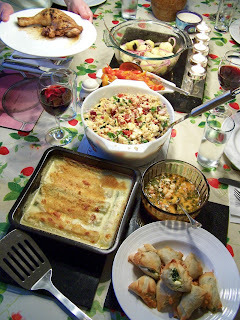 To wit, spanakopita, bottom right hand corner. Baked leaks in Bechamel, an eatmedrinkme stalwart. Prawns in chilli and butter. Cous cous salad with oven dried tomatoes, Pepperonata, potato salad, and lemon and Oreganno Chicken. I differed slightly from the Faling Cloudberries recipe, by not using a full chicken (I used pieces of chicken - legs and thigh from a large free range bird, not the actual oyster, which is a small, dark nugget of meat). 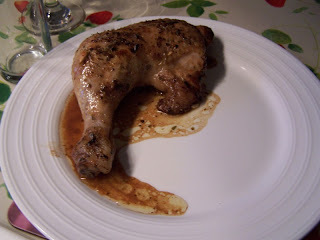 Fry the chicken legs and thighs in oil and butter (circa 50g of butter), on a medium heat, and pour over half the lemon juice, and season with salt and pepper. Turn frequently, until the exterior is quite browned, and the skin crispy. Drain the perky little bugger. Preheat your grill to 180c, and place the chicken in a roasting dish (or, alternatively, barbecue him). rub the oregano between you fingers and coat the chicken with the herbs as they fall. Dot with butter, and pour over the remaining juice. Shove under the grill until cooked. Which could well be longer than you think. I kept turning the blighter to avoid burning, and spooning over the gravy. Serve with the pan juice as a sauce. Beautiful. And an honourable end to a proud bird. Posted by Abulafia at 7:25 p.m.